This past weekend, my Mom and I packed up and headed down to visit my brother, sister in law and my 3 nephews in Virginia. Heather and I were going back to VA Beach to conquer the Shamrock races, I was running the half, she the full. Two years ago this race was Todd& Heather's first half marathon. Now they've both run marathons and triathlons (including a 70.3 each!) and various other muddy mountain runs with those wild obstacles along the course. They're tough, so despite poor Heather's string of injuries I knew she would do just fine on race day. Even with one incident of falling off of the road, she still ran an awesome 4:02. It was a great weekend for everyone because I managed a PR in my race and I was more than happy to break the 1:39 mark in my race. My goal was to beat my time of 1:40:something from 2010, but really I wanted to break 1:40. I was not confident in my ability to run that fast going into this race, not at all. I had a small confidence booster at the Coogan's 5K when I ran the hilly course at 7:01 pace, but that was short- could I maintain a speedy pace for 10 more miles? I get sweaty palms just thinking about it, even now. I was afraid of crashing and burning halfway through, but looking back I really did have a solid base and several long runs under my belt. All I kept thinking was that all of my training was too slow. In my head: My long runs were slow, my speedwork was too short, I didn't do much tempo, etc etc etc... In reality: I'd run steady, progressively longer runs on Saturday mornings for months and I'd done so much inadvertent hill work that I was/am in really good shape. I even ran 16 a few weeks ago! So, the race- Race morning was cool and cloudy and Heather and I were out the door at 5am with a sendoff from the dog and a sleepy Todd. We arrived early, parked and said our goodbyes so Heather could go claim a snoozing spot in the lobby of the Hilton since her race didn't start until 8:30! The half started before the sun was up at 7am but I warmed up quickly once I started jogging to the bathrooms and by the time I reached the corral, I had thrown away my long sleeve top. I was in Corral 1 which was intimidating last time I ran this, but this time I was ready for it because I knew I belonged there. My race plan was the usual: first 6 at goal pace (7:37) even if it felt easy, relax and evaluate my status from 6-8 and then if I was feeling good I'd let myself start to take the pace up through 11 and just go on feel for the last 2 miles. I'm not sure if I'd say I was successful in following my plan or not, but whatever I did worked pretty well. I was trying not to get sucked into anyone else's race for the first 6 miles while I played a little leap frog with a girl in neon pink who was running around a 7:35-7:30 pace. I kept trying to slow down a touch and get away from her, but inevitably we crossed paths several times until the very end. She's in my finish line photos, a step ahead of me (damn her! ), but for the most part I was able to just run my own race. Somewhere along the way I remember thinking that my body wasn't actually doing any work, I was just running along on auto-pilot and it felt smooth and effortless. That was fantastic, but I knew it couldn't last forever. Later that day when my Mom asked me "when does it start to hurt during the race?" I didn't skip a beat, "mile 8". I was struggling just a little bit during mile 8 and 9, but I only slipped to 7:39 for mile 8 which included a water and GU stop. Sometime in Fort Story (miles 7 to 9) I made a friend and he really helped pull me out of my tough spot. Some women ran by in the opposite direction and said there was a tailwind ahead, but he and I looked at each other and laughed when it became a headwind for about 1/2 a mile. We hardly said more than a few words to each other, but we stayed side by side until he saw his family with about a mile to go and he surged ahead about 20 feet. It is always helpful to have someone beside you, whether you know them or not, just to keep from feeling alone on your journey. There were plenty of other goobers around, but no one running as consistently as my buddy Richard. Thanks, man. 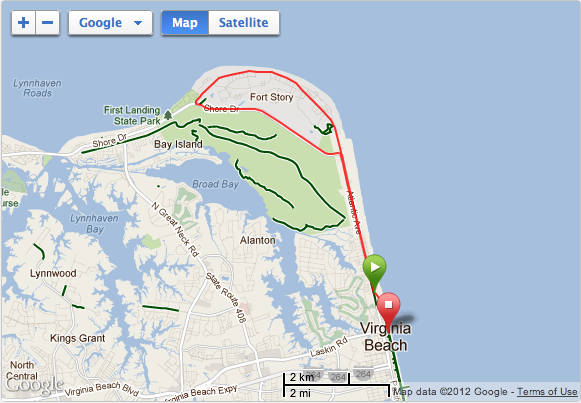 As the race progressed, I began to get a second wind and I brought my mile times down a few seconds each mile from 8 on. 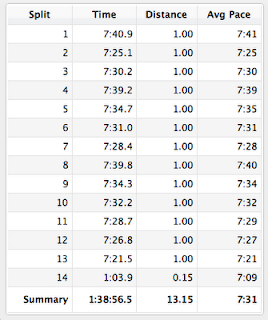 I can tell that I was really running the hardest race possible because I couldn't pick up my pace any more in mile 13 to dip below 7:20 when normally I can bring my final mile down to 7:15 or so. I wanted to give up and die at several points during the final 1/2 mile stretch of the boardwalk too, so that's always a good sign. I was really happy knowing that I'd left it all out there on the course. 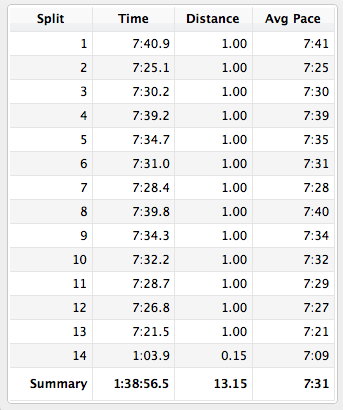 My splits were not as consistent as usual, and I did have a rogue 7:25 in mile 2 after a crowded mile 1, but my slowest mile (1) and my fastest mile (13) are within 20 seconds and I'm happy with that. I actually didn't run one single mile at goal pace. Ha! 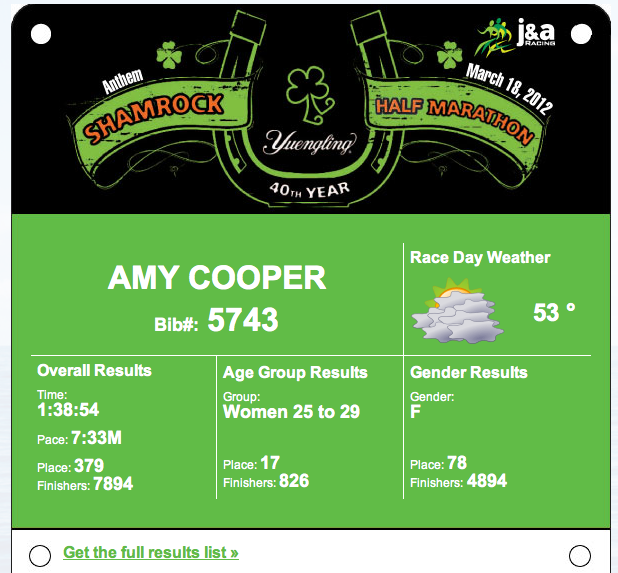 I'm beyond happy with the overall results too, top 100 for women in a race this size is shocking. I hope I can translate this speed into some smaller races this summer and maybe take home a few AG awards here and there. 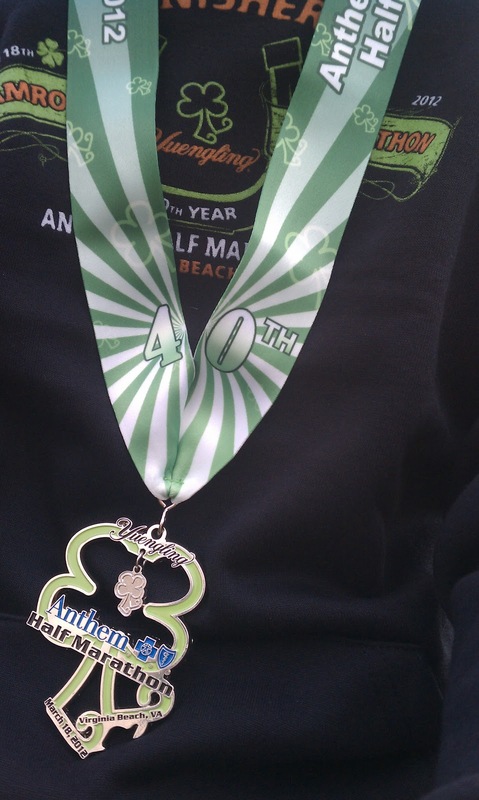 Did I mention that they gave out finisher hooded sweatshirts at the finish?! Take that NYRR!! !